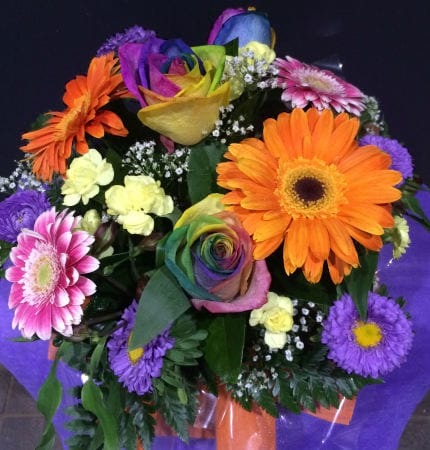 The Rainbow Rose Arrangement is a vibrant combination of fresh seasonal flowers. The spectacular rainbow rose is the feature of this arrangement, and is complemented by bright gerberas, carnations and flowers of the season. Perfect for Birthdays, Anniversary or any occassion at Amaranthine Flowers By Design, your florist in Newcastle. Include a message on our complimentary gift card or enhance your flowers with one of our fantastic add-on gifts, your selction of chocolate, wine, bears, balloons or many more.